Popular This Week: IT Risks and Controls Review Report and more! This week, we are highlighting the Top 5 Pages on KnowledgeLeader from November 5-9! Take a look at the "best of the best" of our tools that could help you simplify your audit projects. The objective of this audit report is to reduce volume of controls to focus on key risks and associated controls, improve consistency of controls across application, infrastructure and IT processes, and clarify control ownership as needed. 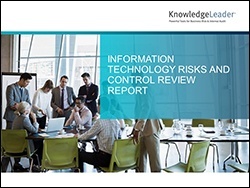 This report includes a process overview, risk review, criteria for control changes, key control review, key IT risks, summary of rationalized risks, reduction of controls by risk, a list of control by risk, and next steps. This sample guide outlines the role of internal auditors in the mergers and acquisitions (M&A) process. As boards are taking a more active oversight role in these deals, they will need assistance to evaluate the risks independently and understand if management is providing the appropriate risk management planning and execution for these transactions. The internal audit function should seek to become involved as early as possible in the M&A process and provide value. The treasury department oversees the cash management, wire transfers, investments and foreign exchange hedging processes. This audit report focuses on opportunities for improvement through interviews and process observations with treasury personnel and limited transaction testing. Objectives include: assessing/evaluating adequacy of the overall financial control environment and significant financial and accounting controls. This tool is a high-level self-assessment checklist for use by an auditee prior to a review of IT application management. This document gives the auditee an opportunity to inform internal audit about controls and processes they employ, and it also gives the auditee ideas about other controls and processes that may be appropriate. In addition to this primary use, this questionnaire can be used during the audit-planning phase to guide the creation of internal audit work programs, during reviews as a checklist that will help you to quickly assess the types of internal controls being employed within a particular process, and as a training tool to educate new internal auditors about processes and their relevant controls.